Boot performance is something that is very important for end-users (customers). You don’t want to wait 3 minutes for your system to boot and be ready for your orders.You want it done as fast as possible. It’s important to know what Windows does when it boots, only then you will be able to know how to increase the system boot performance, so read Learning: How does Windows 8 boot first! Then you are ready to start this How to Increase Windows Boot Time and Boot Performance tutorial. 1% is the lowest knowledge requirement, in fact this should everyone have if they are able to power on a computer (you need to press the power button…) 100% is expert level. What do I need to analyse my Boot Performance? In order to execute all steps in this learning module you need the tool XPerf from the Windows performance Toolkit available in the Windows SDK for Windows 8.1. 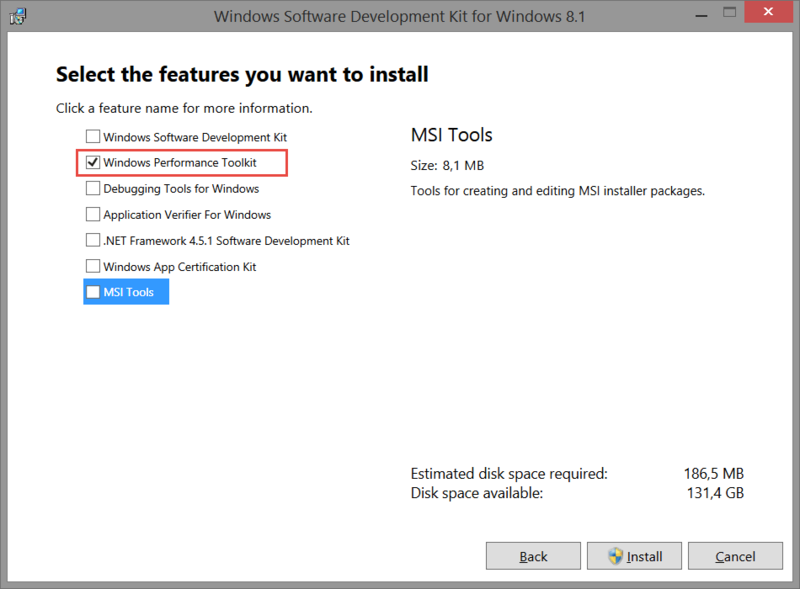 You can download that here http://msdn.microsoft.com/en-us/windows/desktop/bg162891.aspx Be sure you only install Windows Performance Toolkit, the other tools are not required. Once installed, you need to start recording a boot, you can do this with the tool that was installed called xbootmgr.exe be aware that this tool has no UI and it needs to be enabled by the command prompt. Open the most recent .etl file you can find. You’ve now successfully recorded and opened your boot trace. 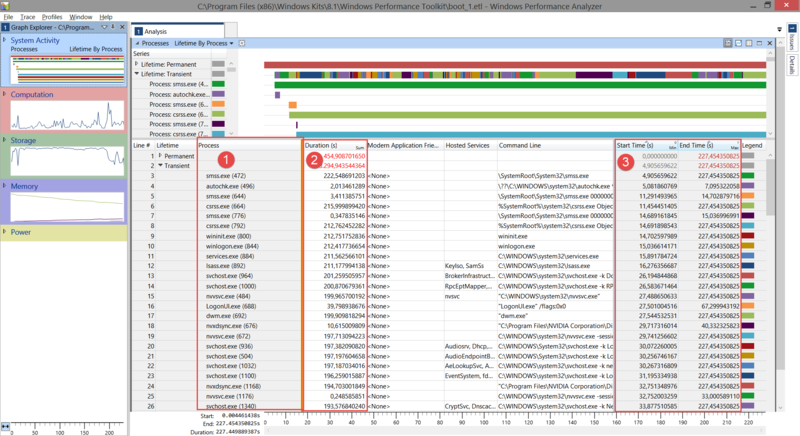 The first time you see the Windows Performance Analyser the information might be a bit overwhelming, its normal! Double-click the first box named System Activity Processes by Lifetime and you should see a screen familiar to this one. See the image above, the most important information, and the information we will work with is marked with red lines. Start Time & End Time This tells you how many seconds after boot the proces it started and how many seconds after boot it finished. As you can see you will see a lot of processes originating from the WINDOWS folder. NEVER disable any of these without checking if this is a legit Windows process. These processes are crucial to your system. The first process in the demo list that is safe to disable such as nvxdsync.exe (1168) however upon a closer view you will see it might be important (“C:Program FilesNVIDIA CorporationDisplaynvxdsync.exe”). The best thing you could do is to search what this process does and if important leave it alone. I recommend using this website to check processes: File.info (http://www.file.info/windows/nvxdsync_exe.html) The next process we actually could disable is MSI_LiveUpdate_Service.exe (1960) and as an example we are going to do that. Since it took 180 seconds to boot it’s a quite heavy program.